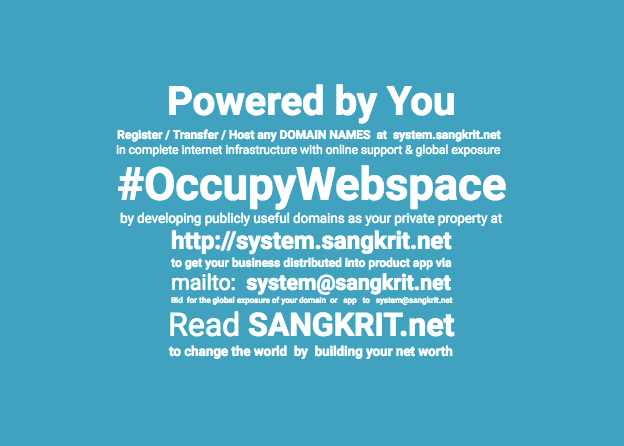 In a rarest of rare gestures, the founder of internet growth engine SANGKRIT.net Rajendra Kumar Pandey today received the founder of free software movement Richard Matthew Stallman at his place. Both of them discussed all possible means and ways of politically intervening for spreading the free software effect across all countries. The meeting lasted for many hours and together they decided to meet many more times through this week to formulate the strategy. 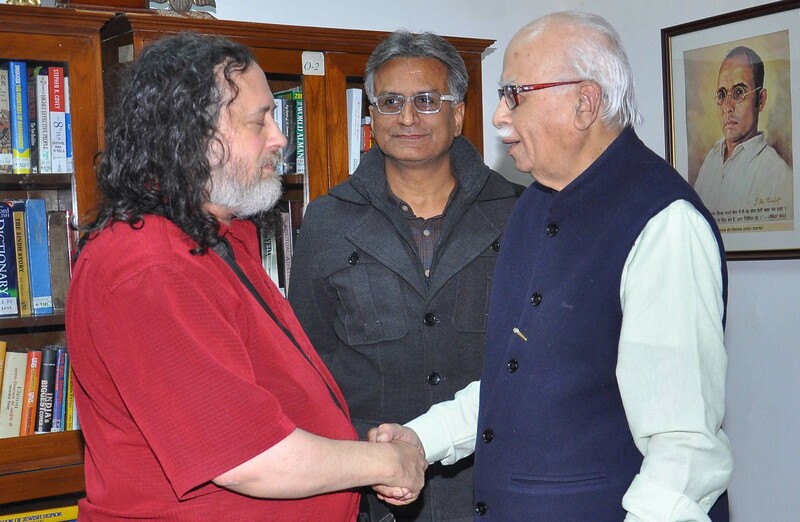 Later on Rajendra Kumar Pandey facilitated a meeting of Richard Matthew Stallman with his close friend L K Advani the Chairperson of National Democratic Alliance in India. During prolonged discussions RMS has told about his visit to Julian Assange in asylum at the Embassy of Ecuador in London and requested the political patriarch for a full-fledged political asylum to Edward Snowden in India (who is concurrently under a temporary asylum in Russia) once the opposition is given a mandate to govern this country through upcoming general elections. Rajendra Kumar Pandey acknowledged that it has been only free software effect that has ultimately caused almost everything admirable through the internet age that include even the political asylums of Julian Assange and Edward Snowden respectively while the rest of internet is still not evolved above 1984 of George Orwell. Mishi Choudhary: Dear Mr Pandey, I am writing to you as a follow up on the dialogue that Mr Advani and Mr Stallman have been engaged in for the past couple of months. I take the liberty to bring to light some developments in India that have greatly tarnished India’s democratic image and its treatment of its citizens rights of free speech and expression as guaranteed by its constitution. As recently as this Friday, Mr Kapil Sibal and Mr Manish Tiwari discussed plans on national television to destroy anonymity and impose further restrictions on social media interactions of citizens. Needless to say, these measures make them extremely unpopular amongst the youth and business. The Information Technology Act, 2000 was amended significantly in the aftermath of the November 7, 2008 Mumbai Terrorist attacks but without any discussion in the Indian Parliament despite making sweeping changes in the cyber law framework. It has proved to be the fulcrum of various contentious issues. Indian authorities have stepped up Internet surveillance and pressure on technical service providers, while publicly rejecting accusations of censorship. The national security policy may also undermine freedom of expression and the protection of Internet users’ personal data. The current government gave itself the power to order the blocking of any online content by Section 69A of the Information Technology Act, 2000. This provision enables the government to order blocking of content. Although safeguards are inbuilt in these provisions, experience in the past one year shows wide variety of misuse for political censorship. The Google Transparency Report for the period July – December 2010 stated that they had received requests from different law enforcement agencies to remove a blog and YouTube videos that were critical of Chief Ministers and senior officials of different states. The report for the period July – December 2012 mentions 60 executive / police orders demanding removal of content that relate to religious offences and 1 relating to national security. The recent spate of orders for removal of content were related to fears of ethic violence against persons from the North-eastern region of the country. Many cases have come to light recently of law enforcement agencies indulging in illegal censorship by asking intermediaries to take down content on receiving complaints about content on these sites. This is often done under section 79 of IT Act and section 91 of the Code of Criminal Procedure. However, this provision only allows law enforcement to ask a person to produce a document in connection with any investigation and does not empower them to demand take-down of any content. Although such an action is illegal and is not backed by any statutory provision, many instances of such abuse of power by law enforcement agencies have been reported. A widely reported incident was when the website www.cartoonsagainstcorruption.com was taken down by the web host on the basis of a communication that they received from law enforcement agencies. Arrests under section 66A for postings on Facebook, Twitter against those in power are becoming commonplace. We have been working actively on these issues in India since 2010. I would be delighted to talk in detail about current issues with you and if his schedule permits, Mr Advani. I am in India from August 14, 2013 onwards and would love an opportunity to discuss these issues. I hate to impose on you but If I may mention that we are also putting together an event especially with the Members of the Parliament on August 26, 2013 at the Constitution Club of India. The event will achieve great encouragement if Mr Advani would agree to speak at it. Please let me know as to how can we be of any assistance. Shardul Pandey: It is gratifying that you decided to write. Yes I do remember that we were supposed to further that important discussion of technology and politics involving LKA and RMS. That actually got started due to my discussion with RMS, which concluded at a point that everything upon internet deserves being implemented in a p2p manner. We said so for preventing humanity from PRISM type of entrapment, although Edward Snowden was still at NSA then. Would you like to say something on that? A lot of things have happened since then. All the apprehensions that RMS made explicit then got realized all of sudden. It is a decisive time to make movement. May be our discussion also contribute something substantial. As first thing I suggest you to share some details here for netizens so that they come to know that what actually is planned for August 26, 2013 at the Constitution Club of India? I will sure be doing whatever may be possible to make it a success. Mishi Choudhary: Dear Mr Pandey, Thank you for your prompt response. Attached herewith is a concept note about the event. I look forward to discussing it in detail with you. Shardul Pandey: OK I am seeing this. Public representatives have already opened up their mind through the legislation that you are protesting about. You should better be explicit that what you have in your mind? What SFLCI has planned for doing with this event; like any memorandum could be given to all of them demanding any particular legislation to protect individual freedom along with social privacy or/and you may ask for their cooperation in your voluntarily helping any victims of any laws ? Mishi Choudhary: Thank you for your comments. We shall take note of those. Do you think Mr Advani would be available to discuss future IT policy or this event with me in person next week? Shardul Pandey: Instead of mere thinking and telling, I took time to find out and what I got to let you know is YES. Mishi Choudhary: Dear Mr Pandey, I am waiting eagerly to meet up with you and Mr Advani to invite for the event on August 26, 2013. Please let me know when is a good time for such a meeting. I look forward to hearing from you. Shardul Pandey: Regrettably I am not in Delhi and Mr Advani has been busy with Parliament. Next week could be a good time for you to meet Mr Advani. I already have forwarded your name and wish for his personal information.